What are Fixed Maturity Plans (FMPs) and who should invest in them? Fixed Maturity Plans are a category of debt mutual funds that are currently attracting the attention of Ultra HNI and retail investors alike. With the debt market looking fragile and the 10 year Gsec yield on a back breaking spree, are FMPs the next alternative investment solutions that can save the investors from interest rate risk? Are FMPs for you, read to find out. Fixed Maturity Plan or FMPs are close ended debt mutual funds that have a fixed maturity period. The AMC launches a New Fund Offer (NFO) and inviting subscription to scheme. Unlike an open ended scheme which stays open for subscription all the time, a FMP remains open for a limited period. The NFO will have a launch date and a closing date till when an investor can subscribe to the fund and after it’s maturity the fund ceases to exist. In the interim, an investor can trade the FMP on the stock exchange. Where do FMPs invest and what are the indicative returns? Being a debt fund, FMPs invest in debt securities like corporate and government of India (GOI) bonds, Non Convertible Debentures (NCD), and liquid instruments like T-bills, Repo, Corporate Deposits (CD) and Commercial Papers (CP), based on the market yield and the scheme’s investment objective, an FMP could invest in AAA to A+ rated securities with varying credit risk. With the 10 year G-sec yields having crossed 7.9% mark, the bond yields too have surged. Now a portfolio of high quality of AAA rated securities can easily give a return in the range of 7.7-8.4% thus making them very attractive. What is the maturity of an FMP? The maturity of an FMP is similar to the maturity of its underlying assets. Since the FMP exists for a fixed period which is defined during the subscription of the NFO, it invests in debt securities with similar maturities such that they mature on or before it’s maturity date. Eg: If the Fund has the maturity period of 1110 days then it will pick instruments that will mature on or before 3 years. The fund manager of a close ended FMP follows a passive investment strategy where in they buy and then hold securities until they mature. Therefore there is minimum churning unlike in a open ended fund where the fund manager churns the portfolio more regularly based on his strategy and market outlook. This helps an FMP keep its expenses lower. Most FMPs have a maturity of 3 or 5 years. Being a debt fund, the biggest advantage of investing in a FMP is the indexation benefit that an investor receives after completing 3 years. Although it is similar to a Fixed Deposit, the tax benefit that an investor earns makes an FMP triumph over any FD or NCDs. Assume you had invested Rs 10 lakhs in a FD and FMP with the maturity of 5 years. Even though return generated by an FMP is higher, to level the playing field lets consider both had generated a return of 8%. As you can see from the table above, you can potentially save Rs 1 Lakh in taxes by investing in an FMP. Even for an investor in 20% tax bracket, the post tax corpus earned from an FD would be significantly higher than a bank FD. What are the drawbacks of an FMP? Being a close ended fund an investor can’t redeem the units until the FMP matures. However, the investor does have an option of early exit through a stock exchange. For this the SEBI has mandated the FMPs to be listed on the stock exchange. The problem is that there is little demand for them in the secondary market and even when there is a buyer the price offered is lower than its NAV. So an investor must subscribe to an FMP with an intention to keep their money locked-in for the duration of the fund and with the knowledge that this money would not be needed in the interim. Also the indexation benefit can be enjoyed only if the debt fund investment has been held for 3 years, so it would be ideal to pick FMP with a maturity of at least 1100 days which is just a few days over 3 years. Who should invest in a FMP? Unlike a debt fund, an FMP is insulated from the interest rate volatility since the fund manager buys and holds the securities until maturity. Thus the returns of the FMP are less impacted by the price fluctuations triggered by the swinging interest rates of the market. Therefore, HNI, ultra HNI in the highest tax bracket, retail investors and even senior citizens can benefit from investing in an FMP as the yields offered are competitive and the capital gains are taxed with indexation benefit making FMPs a very attractive investment solution in the tumultuous and uncertain interest rate scenario. Mr. Pilot – Are you prepared in case of rough weather ? This 7th of December is the International Civil Aviation Day and marks the 50th Anniversary of the signing of the Convention on International Civil Aviation.The purpose of this day, as pilots all over might be well aware of, is to recognize the importance of aviation to the overall development of the world. And while pilots draw great confidence from being able to manage the process of reaching passengers to their destinations safely and comfortably, a more pressing question can be that are they confident when it comes to management of their finances? The profession of a pilot demands almost all their time all year round. Hence they are left with limited personal time which they wish to live to the fullest. And like most busy professionals,more often than not money management seems to come at the end of this wish list. Pilots go through meticulous preparation and planning for their flights daily but sometimes are unable to do so for their finances. Sudden Illness:The requirement for pilots to be medically fit is of prime importance as they are responsible for the lives of hundreds of passengers daily. Every pilot needs to ensure a good health cover to cover sudden illness and hospitalisation. A pilot may wonder why would he need insurance when he is already covered. 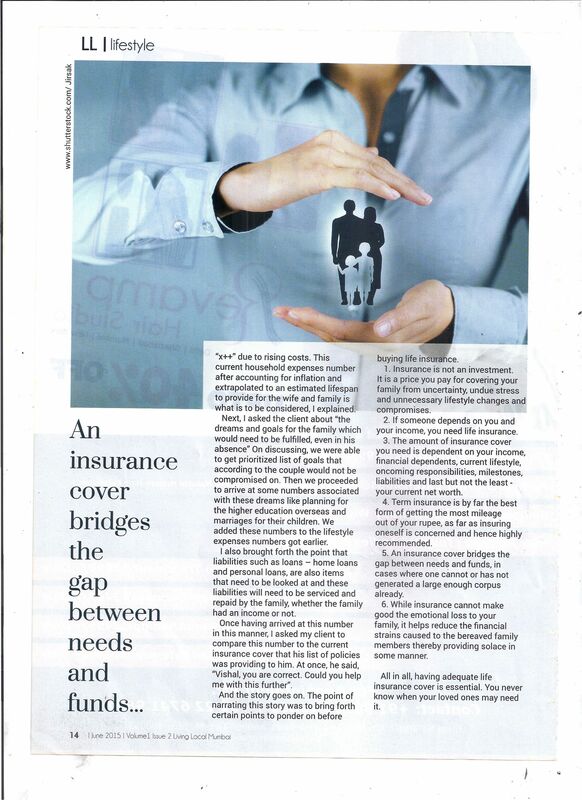 But if one actually things about, it might be prudent to have a separate health insurance cover for times when you may not be employed or between jobs or in cases where employer insurance is inadequate. Need for upgradation of Skill Sets:Like all professions, skill updation is a critical requirement that must be met by all pilots on periodic basis. But these do not come at a cheap cost. Ensuring enough provision and funds are kept aside and is available at the time of requirement can go a long way in avoiding last minute stress. Contingency Needs: A major issue plaguing the aviation industry is the availability of opportunities. The last few years have clearly demonstrated that problems are plenty in the Indian aviation sectors. For eg. Airlines have closed down, pay cuts are becoming common, or there have been significant delays in salary payments. Such events can have huge financial implications on pilots and their families. Having contingency funds parked in highly liquid assets can help bring some normalcy in such difficult times. Retirement and Sunset Years:Insufficient planning for your golden years i.e. Retirement can cause stress. In case of pilots, who are among the top earners amongst professionals, this only magnifies the problem. Why so? Pilots more often than not tend to have busy lifestyles with high discretionary expenses. As such they are accustomed to a lifestyle that will only get more and more expensive as years pass This year on year rise in prices is called Inflation and it is an important factor that more often that not, is grossly underestimated. Furthermore, like any other busy professional, even pilots like to keep themselves occupied during retirement years. The interests or activities that they might pursue would also usually have financial implications. Activities such as investing into various ventures, pursuing hobbies or dream goals, continuing leisure flying by enrolling in the local flying club can be just some of the examples. To be able to fund these without affecting retirement corpus requires careful planning early on. Take the case of pilot Mr. Sharma. Currently aged 30, the household expenses for him and his family is Rs. 12 lakhs per annum. Even if we assume a general inflation of 8%, the same Rs. 12 lakh will become Rs. 1.75 crores at the age of retirement at 65. ( Rules permit pilots to fly till the age of 65 ). In other words, Mr. Sharma would need to have a big enough corpus at retirement that will provide them atleast Rs 1.75 crores every year that will help them maintain current lifestyles. Pilots are aware of the importance of planning. Each flight requires hours of pre flight preparation which means going through weather reports, system checks among other items to ensure that the flight goes by without any hitch. Similarly having a strategic plan in place for one’s finances can also help prepare for any “rough weather” that could come along in a pilot’s financial life. Do Pilots need planning for retirement? Retirement is usually something that is not considered by most of us till we are nearing it, so naturally we do not plan for it, until it is probably too late. This general ignorance or lack of attention to retirement planning can have far reaching consequences. Retirement planning in the simplest sense means preparing for life after the tenure of paid work ends. This does not only include the financial aspect, but other aspects such as what to do during retirement, the lifestyle choices that one can take and what dreams one might want to pursue during the remainder of the years. While the concept of Retirement Planning applies to pilots just as it does to other individuals, there are certain unique points that are exclusive to retirement planning for commercial pilots. These unique points are crucial while developing a retirement plan for a pilot. Firstly, under the current DGCA rules, the retirement age in India has been pushed up to 65. This is an entire 5 years longer than the mandated retirement age in most other industries. This translates to more income earning years, probably at the highest salary slab of the industry, since usually pilots around this age are most likely to have their designations as Captain. This extra income earning period is crucial in formulating and ironing out the retirement plan before the pilot ultimately retires. The significant income flowing could be the difference between living a compromised and a fulfilling retirement. One of the most important things a commercial pilot has to consider is Lifestyle Inflation. Because commercial pilots have one of the best salary packages amongst all industries, they tend to have more lavish lifestyles. And they are comfortably able to match up the ever increasing expenses that come alongside their lifestyle choices. But on retirement, the salary stops. Yet expenses continue to stay, with inflation only adding to it. But more significantly no one would want to compromise on their lifestyle they have become accustomed to. As such it becomes imperative to plan much ahead so that lifestyle compromises don’t become the norm during your golden years. Just to drive home the impact of inflation, let’s take an example. Consider a pilot Mr. A, currently 30 years of age and has a monthly expenditure of Rs 12 lakhs every year (not a very high amount, from what we hear from our pilot clientele). Assuming he will retire at age 65 and taking an average of 8% lifestyle inflation till retirement, the same Rs. 12 lakhs expenditure will inflate to approx Rs. 1.75 crores. In other words, to maintain the lifestyle that costs Rs 12 lakhs as of today, Mr. A would require Rs 1.75 Crores annually to maintain the same expenditure choices, forget upgrading! Furthermore, pilots are used to having extremely busy schedules. So when retirement hits, they are unprepared to handle the ample time in hand. Hence they always look for options to keep themselves engaged. This could mean, taking long leisure trips or finding, researching on and investing lump sums in “exciting investment avenues”, committing money to be part of a start up or just following their long drawn passions or enrol at the local flying clubs just so that they can regularly indulge their lifetime love of flying. All this comes at hefty financial expenditures. All of the above means that Pilots would need to plan and develop customized retirement plans for themselves to ensure a smooth flight during retirement. Personal Finance for Pilots: Why should you consider it seriously! Pilots are probably one of the most stretched professionals when it comes to time management. The constant flux in schedules is always a hassle. Even when you are not flying you are on standby which means that you are still on your toes. The weekly off standard in the Indian Aviation industry is one day every week. And money matters are usually the last thing you want to tackle on such a day. Life is already stressful enough as it is! By most industry standards, Indian pilots take away a very handsome salary. The more experienced you are, the more significant are your financial takeaways. But it is not all rosy all the time. With the high earning potential at a pilot’s disposal, it becomes vital to channelize these earnings to fulfil a whole set of commitments and dreams that are unique to a pilot’s life, both during their career and post retirement. But what are some of these unique problems that only pilots face? Pilots for once, have to always be medically fit. And for good reason! Priority to healthcare hence takes prime importance. Now a pilot reading this might say, oh we are covered by our company, so I don’t have to worry above covering any financial cost regarding my health. But if you really think about it, is that actually enough? Another thing which pilots always need to be on top of is upgrading their skill sets. Not so much a unique item, but very important nonetheless. And it does not come cheap. Preparing for it well in advance can be far more beneficial than just scrapping up every penny at the last moment to fund for this expense. One another issue is the state of aviation industry and opportunities. The last few years have clearly demonstrated that problems are plenty in the Indian aviation sectors. For e.g. Airlines have closed down, (leading large time periods of unemployment), pay can be delayed significantly or indefinitely. All these lead to great financial complications for pilots and their families. Preparing for such circumstances is prudent and must at all times be actively considered. Probably the biggest challenge a pilot will face is retirement! With no more significant inflows, you are faced with a very real possibility of compromising on your lifestyle just because of a lack of proper planning and this change is not easy! This struggle can be easily avoided with some proper and sustained guidance throughout the earning years so that you can live through your golden years in comfort all the while fulfilling your passions. Pilots are well aware of the importance of planning. Every flight involves hours of preparation beforehand so that you can take the best possible decisions in terms of route, landing approach and understanding weather patterns of the areas you will fly through, just to mention a few! As a fellow professional with a prime importance towards professional planning, it would be definitley worth your time for us to meet and discuss how to enrich your life! WITH LIQUIDITY across the globe driving the prices of all assets upwards, and salaries and business profits in India poised for significant gains; all investors seem to be seeking the next big opportunity for huge gains. With stocks, commodities and real estate at record highs, investors are looking at the option of exotic alternative investments. 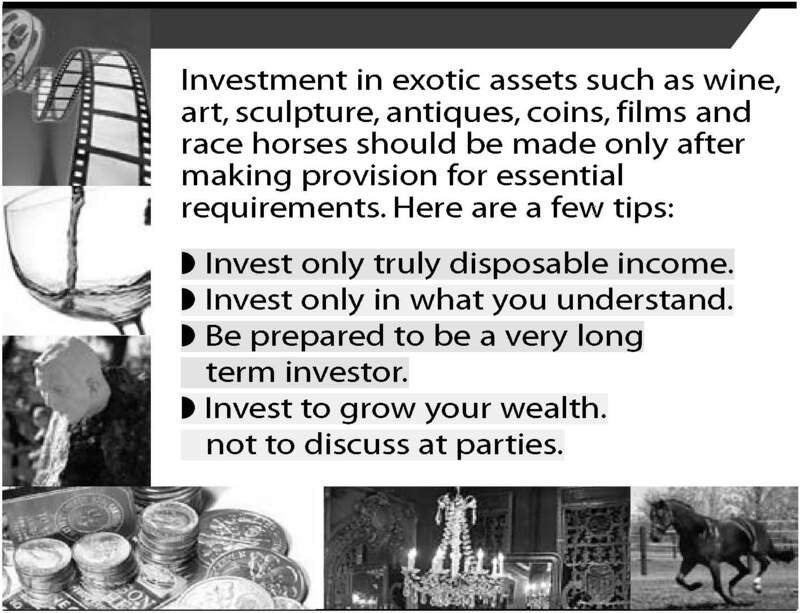 The range of exotic investments are very large ranging from investing in wine, whiskies, champagnes, art, sculptures, antiques, coins, stamps, films and race horses, amongst other items. Whilst each of these sounds like an exciting opportunity, the fundamental tenets of investing need to be kept in mind before making investment decisions in these products. In fact, sticking to the basics is probably even more important whilst investing in some of these exotic products. Investing toward primary goals like education for children, retirement, home purchases and medical pro-visions need to be made into assets that have clearly verifiable track records so that you do not compromise any of these goals by allocating funds into these asset categories. Invest only a small portion of your wealth into this category if you finally decide to. Being a connoisseur of wine or whisky, or purchasing paintings for putting up on the walls of your home does not make you an expert on the subject or give you the ability to make a good investment in the same. Just like driving a car to work everyday does not equip you to participate in a Formula one race. If you are willing to buy a painting anyways because you really like it, go ahead and do the same but don’t believe that it is an investment that is likely to appreciate significantly. You will need the help of an expert if you wish to invest in this category. Look for a clear track record of the person making the investment recommendation and do not be in a hurry to close the deal if you have not done adequate due diligence. You will do well to remember that investors in exotic investments burnt their fingers in the last bull run of 2007. ■ Investments in this space can take an extremely long time to deliver returns so you need to be extremely patient. During a downturn, these investments could lose significant values so you need to have the financial strength to hold during a downturn. Also remember that pricing of these assets can be very subjective, so it may not be easy for you to value your portfolio accurately. ■ Do not buy these products just because it makes great conversation at the next wedding party that you attend. If you are convinced that you have done enough research and there is a sound track record of the manager of these investments, only then go ahead. Don’t get carried away by the optimism in the air when you discuss these options with your wealth manager. 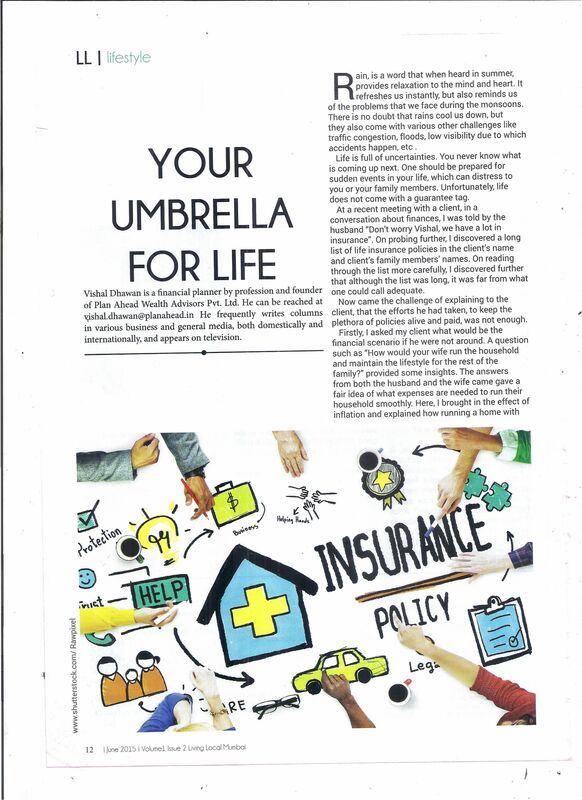 This article was written by Vishal Dhawan, CFPCM and appeared in the Asian Age on 25th Deccember 2010 .